Nursing homes are intended to provide the round-the-clock care to residents that is beyond the capabilities of the resident’s family. Unfortunately, one does not have to look hard to find examples of nursing home abuse and neglect across the country. Family members may feel powerless to stop staff abuse and misconduct since it is not possible for someone to be there all the time. Residents with the least amount of family involvement are the most susceptible to abuse since staff does not have to worry about someone checking on the resident’s welfare. However, even those with consistent family involvement are not exempt from suffering harsh treatment from a caregiver. A husband who visits with his wife living in Boca Raton nursing home six to seven hours a day recorded a certified nursing assistant abusing his wife by moving her breathing tube and then ignoring an alarm signaling it was disconnected. While a large amount of trust must be placed on the nursing home to provide appropriate and adequate care, family members can take proactive steps to ward off, or at least quickly identify, abusive behavior before substantial harm occurs. The first days in a nursing home facility are often the hardest for the new resident and the responsible family members. Even at this early stage, it is important to start building a knowledge base about the facility and staff in case changes occur in the future. 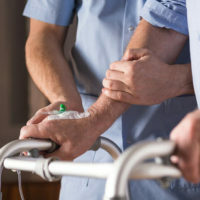 If the transition to the nursing home was the result of a crisis, as many are, ensuring the loved one receives the proper assessment following discharge from a hospital and active involvement in the care plan will give family members a chance to get a feel for the facility and let staff know the family will be an advocate for the resident. As alluded to above, regular and frequent visits are the easiest and best way to catch issues that could lead to abuse at a later time. Further, visiting at different times of the day, especially during meal times, at night, and over weekends/holidays will allow family members to assess the quality and pattern of care provided by the nursing home. Importantly, varying the times of visits may prevent caregivers from being lax or inattentive since they do not know when a visitor may show up. physically inspecting the resident for sores, bruises or other signs of inadequate care. Florida law requires nursing home administrators and management to oversee the care of residents and operations of the facility. If a resident is injured by a caregiver due to abuse or neglect, the nursing home could be liable for negligence and required to compensate the resident. Discovering a loved one suffered abuse under the care of a nursing home is horrible and understandably upsetting. Do not let this unacceptable behavior go unpunished. Contact a personal injury attorney specializing in nursing home abuse to evaluate the case, like the Miami law firm of Pita Weber Del Prado. The attorneys at Pita Weber Del Prado understand how sensitive these situations are and will fight to hold the nursing home accountable. Contact us today for a free consultation.